Former Governor Jay Nixon (D) [2016 file photo]. ….Located in Reynolds County, the park’s rugged landscape serves as a backcountry access to the Ozark Trail, which links Taum Sauk Mountain and Johnson’s Shut-Ins state parks. The park features rugged terrain and unblazed trails, making it perfect for those familiar with wilderness travel and seeking a true backcountry experience. The park also includes a rare mountaintop lake, which is home to bluegill and largemouth bass. The park is named for Missouri’s 55th Governor, whose support for conservation and state parks has been nationally recognized…. Missouri’s newest state park offers an outstanding backpacking experience in the heart of the rugged St. Francois Mountains. Missouri State Parks has announced the opening of Jay Nixon State Park, 1,230 acres of wooded, rugged terrain that includes opportunities for backpacking with a connection to the Ozark Trail. Located in Reynolds County, the park’s rugged landscape serves as a backcountry access to the Ozark Trail, which links Taum Sauk Mountain and Johnson’s Shut-Ins state parks. The park features rugged terrain and unblazed trails, making it perfect for those familiar with wilderness travel and seeking a true backcountry experience. The park also includes a rare mountaintop lake, which is home to bluegill and largemouth bass. The property was purchased in 2015 with funds received from a Natural Resource Damage Assessment and Restoration settlement with the American Smelting and Refining Company LLC (ASARCO). The Missouri Trustee Council, which includes the U.S. Fish and Wildlife Service and the Missouri Department of Natural Resources, reviewed the proposed purchase at a public meeting on Dec. 18, 2014 at Johnson’s Shut-Ins State Park. Currently, there are no facilities at the state park, which can only be accessed from the Ozark Trail. In the future, basic services such as campsites, water and restroom facilities may be added. Bordered by Taum Sauk Mountain State Park and close to Johnson’s Shut-Ins State Park, Jay Nixon State Park makes a great addition to anyone seeking a backcountry experience. The park is named for Missouri’s 55th Governor, whose support for conservation and state parks has been nationally recognized. With the addition of Jay Nixon State Park, Missouri State Parks now offers 92 state parks and historic sites. INTRODUCED BY REPRESENTATIVE FITZWATER (144). To amend chapter 253, RSMo, by adding thereto one new section relating to the renaming of a certain state park. 253.125. The state park currently known as “Jay Nixon State Park” located in a county of the third classification without a township form of government and with more than six thousand but fewer than seven thousand inhabitants and with a city of the fourth classification with more than one hundred fifty but fewer than two hundred inhabitants as the county seat shall hereby be renamed, known, and cited as the “Proffitt Mountain State Park”. Any such costs expended for the renaming of such state park shall be paid by the department. Governor Jay Nixon [2016 file photo]. Instead, you have repeatedly cut funding for an indigent defense system that continues to rank 49th in the U.S., with a budget that the consumer price indicates has less value now that it did in 2009. After cutting $3.47 million from public defense in 2015, you now cite fiscal discipline as reason to again restrict MSPD’s budget, this time by 8.5%. However, and despite claims that revenues are considerably less than expected, you did not restrict a single dollar from your own budget, and the average withhold from 12 of your executive agencies does not even add up to one half of one percent (.47%). This action comes even after the Civil Rights Division of the Department of Justice found that poor black children are being systematically deprived of their rights in Missouri due in large part to the lack of public defenders. Choosing in the wake of that report to further debilitate the very organization that ensures an equal system of justice only adds to the escalating sentiment that the poor and disenfranchised do not receive a fair shake in Missouri’s criminal justice system. As of yet, I have not utilized that provision because it is my sincere belief that it is wrong to reassign an obligation placed on the state by the 6th and 14th Amendments to private attorneys who have in no way contributed to the current crisis. However, given the extraordinary circumstances that compel me to entertain any and all avenues of relief, it strikes me that I should begin with one attorney in the state who not only created this problem, but is in a unique position to address it. Therefore, pursuant to Section 600.042.5 and as Director of the Missouri Public Defender System tasked with carrying out the State’s obligation to ensure that poor people who face incarceration are afforded competent counsel in their defense, I hereby appoint you, Jeremiah W. (Jay) Nixon, Bar No. 29603, to enter your appearance as counsel of record in the attached case. I do believe there are a number of members of the General Assembly who are also members of the Missouri Bar. Jefferson City, MO – Gov. Jay Nixon today vetoed Senate Bill 656, which would have eliminated the current requirements that individuals must obtain training, education, a background check and a permit in order to carry a concealed firearm in Missouri. The bill would have allowed individuals, including those from other states, to legally carry a concealed firearm even though they have been denied a permit because their background check revealed criminal offenses or caused the sheriff to believe they posed a danger. The Governor will be discussing his veto during an address this morning to hundreds of law enforcement officers from around the state at the Missouri Police Chiefs Association annual conference. Since 2003, Missouri law has set forth a process for obtaining a concealed carry permit. This well-established process requires classroom and range training, as well as a background check and review by the sheriff, before an applicant can obtain a concealed carry permit. Under this well-established process, sheriffs have also appropriately rejected many individuals’ applications and those decisions have been upheld by courts on appeal. In his veto message, Gov. Nixon provided examples of individuals who could automatically carry a concealed weapon under this law who cannot do so today, including individuals who have pled guilty to a felony and received a suspended imposition of sentence; individuals who have been convicted of misdemeanor assault; and individuals with two or more misdemeanor drug possession convictions. The Governor’s concerns echo those voiced by law enforcement agencies, including theMissouri Police Chiefs Association (MPCA), representing 600 members statewide, and the Missouri Fraternal Order of Police, which represents 6,400 law enforcement officers across the state. By they way, there’s that other piece of right wingnut stupidity in the bill – “stand your ground”. 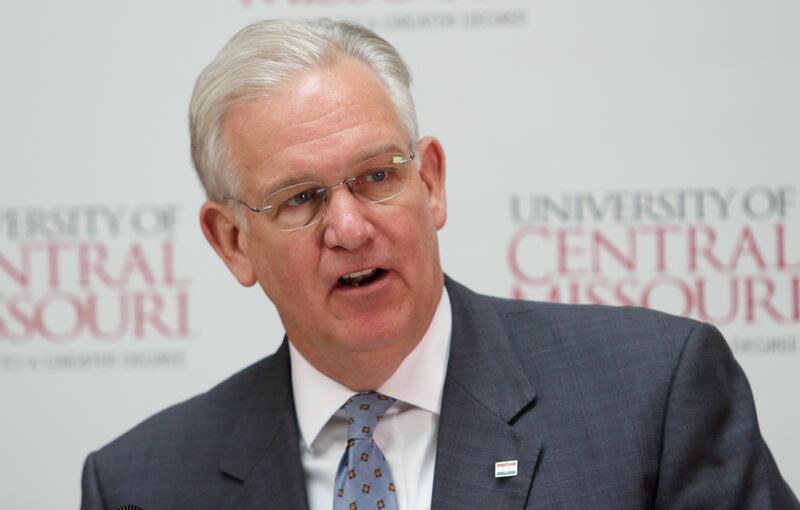 Governor Jay Nixon (D) traveled to Warrensburg this morning to sign SB 997, a higher education bill, on the campus of the University of Central Missouri. Governor Jay Nixon (D) – in Warrensburg – June 16, 2016. Question: ….Governor, as you’re looking at bills that you have to consider Senate Bill, uh, 656 is coming up. Where are you with that? Governor Jay Nixon (D): Which one? I’m sorry. Question: That’s the, uh, the, uh, um stand your ground. Governor Nixon: Well, I mean, we’re, all the bills go through a pretty, uh, you know, thorough review. Um, you know, that’s one which I’m looking at very carefully because, uh, you know, a few years ago we, we struck a deal to put, uh, sheriffs in a position where they, uh, had the ability to, um, review and, uh, reject, uh, conceal carry permits. Uh, to move to a point which you took that power away from sheriffs, took that responsibility away from them and their communities is something that, uh, that, that we’re looking at very, very carefully. But, I, I haven’t made a final decision on the bill other than to say that, uh, when, when the legislature comes and, and moves policy pretty significantly from where we all agreed it should be a couple years ago that gets a very close review. Question: So, are you getting any kind of public, uh, feedback on, on the bill? 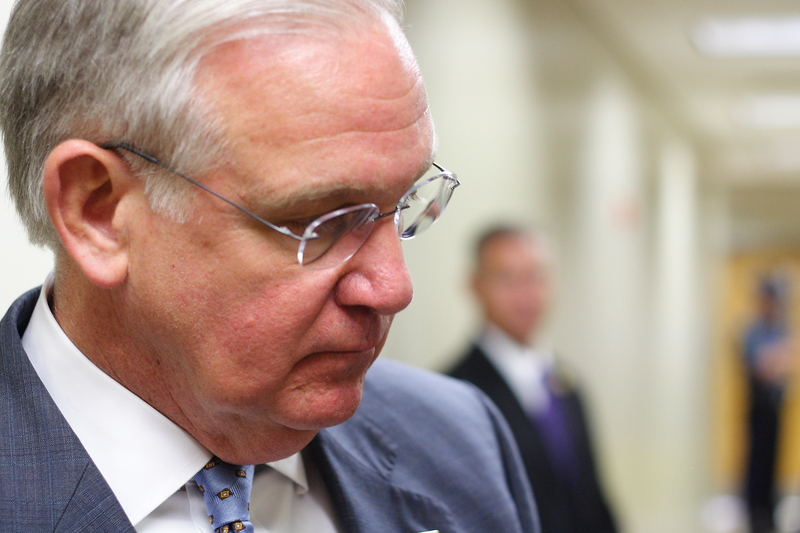 Governor Nixon: Um, when I, when I make that decision I’ll do that publicly for sure. But we’re still in the bill review process and still, uh, gathering facts and information. And, and, uh, when I make my final decision I’ll certainly make that public. Question: I have a question on the voter ID law. I understand that’s actually a two part law. Uh, I have it on good authority and the, as I understand it one part puts it on the ballot, that’s pretty much a gotta do thing, but what’s that second part that you have veto power over? Governor Nixon: Yeah, the first part is to put a constitutional amendment on the ballot for this, this fall. I placed it on the November ballot so that the most people would have a chance to see, uh, whether they wanted to, uh, to support that or not. The second piece is they went ahead and passed in, in essence what’s called implementing legislation, uh, before that vote. Um, I look at this, this bill, um, you know, my position is we should make voting available to as many people as we possibly can. I mean, and we should make it as easy as we possibly can for people to vote. Uh, and, uh, so we’re reviewing this, this is relatively similar to a measure that I vetoed a few years ago, uh, that would have, uh, made it very expensive and difficult, especially for senior citizens and others that didn’t have driving privileges to, uh, to get a separate state issued ID. So, um, it’s not an area that my, my general philosophy is let’s make voting, uh, easier for folks, um, so this kind of, uh, comes at that. But, I haven’t made a final decision on that, but we’ll, uh, we’ll be acting on that one relatively quickly. Question: [crosstalk] If you were to in theory, not that you’re going to, veto this what would it do in terms of the effect on the vote that [crosstalk] comes in November? Governor Nixon: Well, it, wouldn’t really effect the vote in, directly, in the sense other than it would be, I would, I would lay out what I thought the, my position was at that time. But, you could, you could, uh, the public would then have to vote and assuming that veto was, uh, uh, upheld, uh, then the legislature has to come back next year and put, put rules and regulations in this. So, um, but, uh, I think we’re a long way to the finish line there. I do think that the basic philosophy I have is let’s make voting more open and easy, and especially for, for seniors and, and other folks that don’t drive. Um, it’s, it’s, uh, it’s , it’s extremely challenging to say that, uh, we should make it more difficult for them to cast what is, uh, one of the fundamental rights of citizenry…. Democratic Senator Claire McCaskill wasted no time coming out for Hillary Clinton. Her alacrity – she endorsed Clinton in June, declaring that “it’s important we start early” – suggested to some that she saw the writing on the wall when it came to 2016 and she was sure that it spelled “Hillary.” Naturally, so the story goes, McCaskill had some work to do to make nice with the candidate she dissed in 2008 in favor of Barack Obama, hence the early endorsement. Heartland! Save me from all the cliches. Of course Democrats maintain a big tent. If we didn’t, neither Nixon nor McCaskill would be welcome. That’s something that the Sanders’ insurgency is making very clear. … the political science tells us that perceptions of moderation in a candidate — as opposed to perceptions that a candidate is outside the mainstream — actually can make a difference. So does the history (see Goldwater, Barry, and McGovern, George). To be clear, I’m not saying Sanders could not overcome perceptions as out of the mainstream, if such perceptions do currently exist. He might be able to do that. It’s possible such perceptions might not form at all. But it’s also very possible that Republicans could successfully paint Sanders as an ideological outlier, and that this could matter. It’s not crazy, illegitimate, or out of bounds to raise these concerns. … The Sanders camp points out that only he can motivate younger and newer voters, as evidenced by what we’re seeing in the Democratic primary. The question of whether Clinton can motivate those voters is a very serious concern, one that has been raised by veteran Democratic pollsters such as Stan Greenberg, and one that really does call into question whether Clinton will be able to win in November. Meanwhile, to my knowledge the Clinton camp has not meaningfully addressed the fair point that she made similar “electability” arguments against Barack Obama in 2008, which turned out (obviously) to be very wrong. Add the on-going GOP efforts, aided and abetted by mainstream media, to paint Clinton as untrustworthy and “unlikeable,” and you may have a real argument. But maybe the anti-Sanders contingent is right. Maybe the only thing that will save the election for the Democrats is the primacy of one of the really ridiculous Republican candidates. Who knows? Elections are never certain, and while I understand the legitimate anxiety that prompts concerns about electability – the ugly GOP presidential line-up and the destructive nature of even the so-called moderates’ positions justify our worst fears – that is not the criteria that should determine one’s choice of candidate. All I know is that I’ll support either candidate with my whole heart when the primary is over. I also know that I’ll be glad to see the back of Jay Nixon though I’ll have to hold my nose and vote for the pseudo-Democratic candidate, Attorney General Chris Koster. Same goes for that inestimable centrist, Claire McCaskill, if she runs again – although I don’t think that the powers that be can guarantee her the gift of another Todd Akin. If you have a voice you have an obligation to use it. 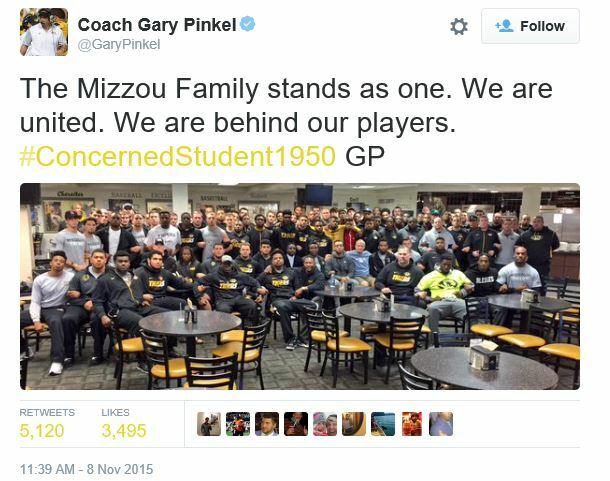 The announced strike by black football players at the University of Missouri is far more than a sports story. It further thrusts the school into the national spotlight regarding racial unrest, especially on college campuses. The players are seeking a huge change. They want the resignation or firing of the state’s top university official, president Tim Wolfe. Others have called for that action — including a student engaged in a hunger strike — but the involvement of the school’s best-known sports team demonstrably increased attention to this issue…. JEFFERSON CITY – Gov. Jay Nixon today issued the following statement regarding student protests at the University of Missouri. If you speak out someone else may listen. As if Rex Sinquefield is finished with Missouri? 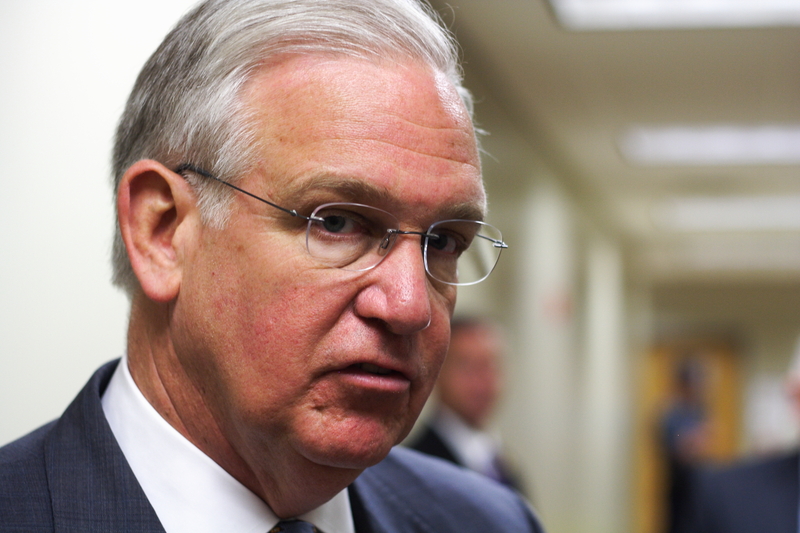 As far as we can tell Governor Jay Nixon isn’t running for another political office in 2016.